Many people struggle with excessive sweating problems. These sweating issues can be a nightmare and actually lead to serious health concerns. That’s why it’s important to seek professional help if you find yourself needing to constantly control excessive sweating. Hyperthyroidism — This is when too many thyroid hormones are circulating throughout a person’s body. Hyperthyroidism symptoms vary, and it doesn’t become too serious until the later stages of the condition. The body’s chemical processes are sped up by this condition and creates rapid sweating issues. Extreme Stress and Anxiety — Anxiety and stress disorders can result in excessive sweating as well. When the body is under too much stress, the temperature rises and eventually leads to sweating. The worst part of this cause is that once the sweating begins, the anxiety and stress magnifies because of the sweating and subsequently leads to more sweating. Medicinal Complications — Certain medications can lead to hyperhidrosis in some people. High blood pressure medicines, dry mouth remedies, and a few supplements and antibiotics all can lead to sweat problems in certain people. Because these problems can be so severe and lead to additional medical issues, hyperhidrosis treatments are often necessary for long-term recovery. There are a few hyperhidrosis treatments that work well for certain people, but one of the most effective treatments is the use of iontophoresis devices. Iontophoresis has been used to combat hyperhidrosis since the 1940s, especially for the feet and hands. But recently, thanks to Hidrex USA, the device can be used to effectively treat other parts of the body as well. The iontophoresis device, also called a “no-sweat machine,” requires about six to 10 treatments to fully shut down the body’s sweat glands, and each therapy session lasts roughly 10 to 20 minutes. According to the International Hyperhidrosis Society, iontophoresis hyperhidrosis treatments helped wholly 91% of patients with excessive hand and feet (palmoplantar) sweating find relief. Don’t let excessive sweating become a regular issue and ruin your life. Contact Hidrex USA to learn more about our FDA-approved Iontophoresis device and rid yourself of excessive sweating. You deserve to get back to a sweat free life. <img class="alignright size-medium wp-image-68208" src="https://www.hidrexusa.com/wp-content/uploads/2016/12/iontophoresismachine-200×300.jpg" alt="iontophoresis machine" srcset="https://www.hidrexusa.com/wp-content/uploads/2016/12/iontophoresismachine-200×300 generic singulair.jpg 200w, https://www.hidrexusa.com/wp-content/uploads/2016/12/iontophoresismachine.jpg 566w, https://www.hidrexusa.com/wp-content/uploads/2016/12/iontophoresismachine-200×300@2x.jpg 400w” sizes=”(max-width: 200px) 100vw, 200px” />The average person has between two million and four million sweat glands working as the body’s coolant system to prevent it from overheating. It’s totally normal to sweat during an intense workout or on an unusually hot day, but if you find yourself drenched in sweat while you’re shopping or watching a movie, you may have a condition known as hyperhidrosis. Hyperhidrosis causes one to perspire as much as five times more than the average person. The sweat glands are active even when the body doesn’t need to cool down. While researchers haven’t yet determined the cause of hyperhidrosis, many doctors believe that it occurs due to a miscommunication between the sweat glands and the brain. Hyperhidrosis is most likely genetic, as about 30% to 50% of those afflicted have another family member with the same condition. Hyperhidrosis tends to present itself in five primary areas – the arm pits, the palms, the bottoms of the feet, the face, and the scalp. Sweating is usually symmetric as well, meaning that if one palm is excessively sweating, the other is, too. “If you’re sweating constantly in the winter in Chicago, that’s probably excessive,” says Dr. Patricia Farris, a clinical assistant professor of dermatology at Tulane University. Basically, if sweating disrupts your everyday life, it’s too much. Doctors say that when it comes to diagnosing the condition, it’s less about the amount of sweat and more about the emotional and psychological effects of the sweat. If you change your behavior because you are concerned about the amount you’re perspiring, you’re sweating too much. 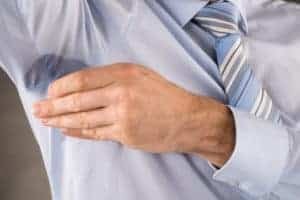 For instance, some sufferers of hyperhidrosis wear only dark clothing or keep extra shirts at the office so they can change to hide their sweat. Others keep paper towels in their purse or pockets, to wipe their hands on throughout the day. If this sounds like you, you may have an excessive sweating condition. Fortunately, hyperhidrosis treatments, like iontophoresis machines, do exist. Iontophoresis machines, or “no-sweat machines” shut down the sweat glands to effectively reduce perspiration. For more information, talk to your dermatologist or leave a question or comment below.